Kino Lorber remains committed to releasing Buster Keaton feature-length silent films on Blu-ray, which began almost a decade ago with several stand-alone and "double feature" discs, plus a handy boxed set (re-released last November with a few modest upgrades, to make things even more confusing). This time around, it's back to the well for another of Keaton's biggest hits, paired with a lesser-known entry and armed with new 2K restorations and bonus features courtesy of French distributor Lobster Films. Whether or not you're up for a double dip (or is it triple?) will depend on your enthusiasm for silent slapstick, but the genre's continued presence on Blu-ray is definitely a good thing. 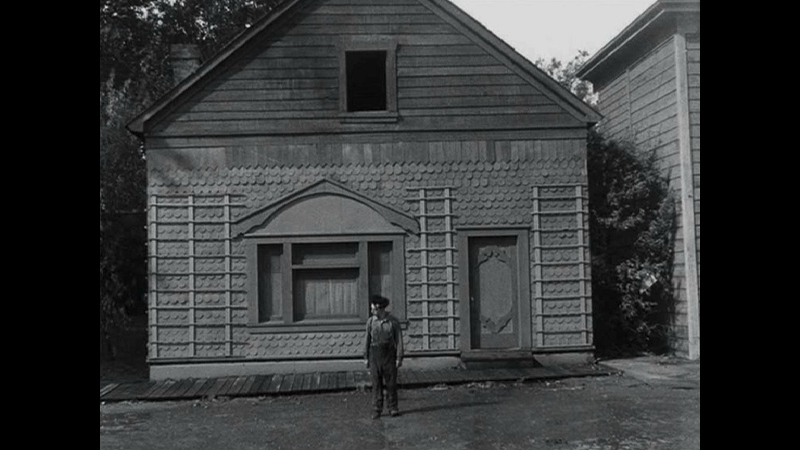 Bursting at the seams with slapstick, stunts, and star power, Buster Keaton's beloved Steamboat Bill, Jr. (1928) is about as entertaining as films get, silent or otherwise. This story of a young man, his reluctant father and a creaky old steamboat starts small and finishes huge, culminating in a high-powered hurricane that literally wipes out an entire town. The steamboat in question is the Stonewall Jackson, and stiff competition arrives when a new luxury steamboat is unveiled by rival entrepreneur J.J. King. But the tough-as-nails William "Steamboat Bill" Canfield, Sr. (Ernest Torrence) won't give up easily: he's been running the Stonewall Jackson through Mississippi waters for most of his life. The same day, Canfield's son is due for a visit; they haven't seen each other in years, and the sea captain can't wait to see how his son has grown. Imagine his disappointment when William, Jr. (Keaton) turns out to be a scrawny, bookish young college boy with little interest in his father's trade. Nevertheless, it's up to both Bills to ensure that their family business isn't forced completely out of the water by King's powerful paddleboat. Inevitably tied to The General (due to their large budgets and close release dates), Steamboat Bill, Jr. is anything but a rehash of old material. There are plenty of similar obstacles to overcome and Keaton's character also pines for a young woman---in this case, King's daughter (Marion Byron)---but Steamboat Bill, Jr. uses a smaller atmosphere to get the job done. The father-son relationship creates a great dynamic: there's disappointment on both sides at first, but it's easy to see why they finally accept one another. Of course, it goes without saying that its biggest highlight is the third-act hurricane sequence, during which a town's worth of buildings comes crashing down around our pint-sized hero. From the 45-degree walk against powerful winds to a building wall literally falling on him, Keaton carries the climax to blistering heights. This 15-minute sequence used half of the film's $400,000 budget, and Steamboat Bill, Jr. just wouldn't be the same without it. Whether you've seen the film dozens of times or haven't had the privilege yet, it's nearly impossible to make it through without gasping...or at least grinning from ear to ear. Also here is College (1927), produced and released between The General and Steamboat Bill, Jr....not to mention the first time since debut film The Saphead that Keaton released less than two pictures in a year. It's a nice breather from those higher-budget films but, like Three Ages, not among Keaton's best work. The plot itself is very straightforward: Keaton's unnamed character (listed as "A Boy" in the credits) once again pines for a lovely young lass---this time, it's Anne Cornwall listed as "A Girl"---and rubs his entire senior class the wrong way when giving his "books over sports" graduation speech. He enrolls at her college to convince her of his athletic prowess, which comes in the form of at least a half-dozen failed attempts at track and field, baseball, football, and just about everything else. Yet the uncoordinated "Boy" gets a second chance on the college's rowing team, eventually turning into spinach-fueled Popeye when his love interest is threatened by a domineering jock. Highlights: Keaton's disastrous attempts to keep part-time jobs (save for a cringeworthy "blackface" scene), tons of slapstick, and a rare instance of Keaton using a stunt double during the climactic pole vault attempt. Still, a minor entry in Keaton's catalog at best. Presented in their original 1.33:1 aspect ratios, Steamboat Bill, Jr. and College look terrific in 1080p thanks to Lobster Video's new 2K restorations. It's obvious there's been a good amount of clean-up work here: a lot of dirt, flickering, damage, and the occasional missing frame(s) still remain, but all of these issues are perfectly acceptable considering both films are roughly 90 years old. The transfers are very stable with solid image detail and even a good amount of textures during many of the outdoor scenes. Although Cohen Film Collection's 4K restoration of Steamboat Bill, Jr. (and several other Keaton films) has been prepped since 2013 and will most likely be issued on Blu-ray in the near future, this still represents the best current presentation of both films on home video to date. 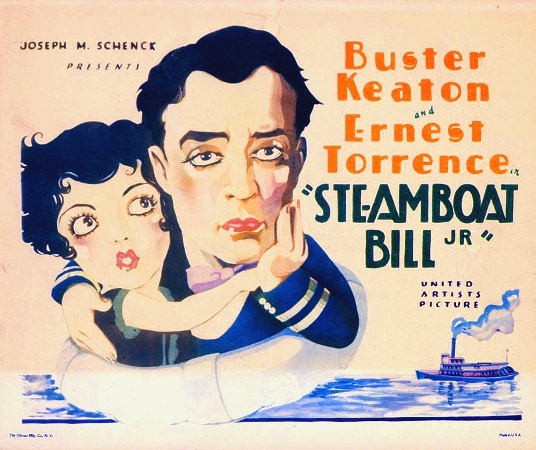 Both Steamboat Bill Jr. and College include two different scores (orchestral or solo organ), with all four presented in lossless PCM 2.0; those from Steamboat are composed by Timothy Brock and Lee Irwin, with the latter by the Mont Alto Motion Picture Orchestra and John Muri. I definitely preferred the more orchestral Brock and Mont Alto scores, as their larger presence and occasional "sound effects" really added to the atmosphere in scenes such as Steamboat Bill, Jr.'s intense hurricane and College's rowdy sporting events. Yet the somber---and probably more authentic---organ scores are an interesting option, so try 'em all and decide for yourself. Channel separation is strong with moments of depth and excellent clarity from start to finish. Aside from the possibility of missing earlier scores, it's tough to complain: silent films rarely if ever have "official soundtracks", so it's all a matter of preference. Featuring a basic and classy interface with relatively quick loading time (prefaced by a short video clip touting the new restorations), standard options include chapter selection, audio setup, and bonus feature access. This two-disc release is housed in a dual-hubbed keepcase with attractive cover art; no insert or slipcover are included. Again, things are a little complicated here. One new extra is exclusive to this release: a full-length Audio Commentary during Steamboat Bill, Jr. with historians Michael Schlesinger and Stan Taffel, who go into detail about the film's production and lasting impact. 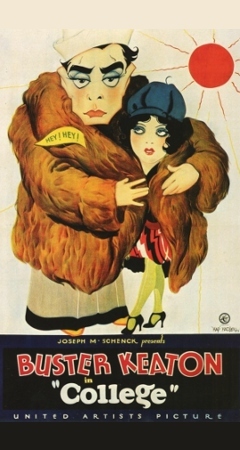 Other topics of discussion include Keaton's loss of independence after the film's release, supporting players including Marion Byron and Ernest Torrence, Keaton's personal life and struggles with depression, Steamboat Willie, silent film negatives, Jackie Chan, the cinematographers, the Keaton family's Vaudeville routine, Fatty Arbuckle, and much more. It's another detailed and entertaining track from start to finish; I learned quite a bit from this, as I don't recall any previous releases of Steamboat Bill, Jr. featuring a commentary. Several other bonus features (not advertised as "new", but to my knowledge they've never appeared on a domestic home video release of either film) are here too, including short Introductions to both films by French producer Serge Bromberg and a second one for College by late actress Lillian Gish, as well as the 1928 silent short Run, Girl, Run starring Carole Lombard. The latter is kind of an odd inclusion but fits in thematically with College, although it's just as thin plot-wise and without the added bonus of Keaton's visual stylings or physical ability. Otherwise, all of the supplements from the 2016 boxed set---and, by extension, the 2012 boxed set and any stand-alone Kino Blu-rays---have been carried over. These include a 10-minute Filming Locations Tour with author John Bengston, the Canadian promotional safety short The Scribe (released in January 1966, and Keaton's last on-screen appearance before his death only three weeks later), and an Audio Commentary for College by film historian Rob Farr. Overall, a small but interesting collection of film-specific supplements and pop culture curiosities. Featuring new 2K restorations by French distributor Lobster Films, this double feature of Buster Keaton's Steamboat Bill, Jr. and College plays well on Blu-ray. Having never seen the latter before now, it's best viewed as more of a supplement than companion piece and obviously not the main selling point. Both films look and sound better than ever (although Cohen Film Collection's 4K restorations of Steamboat Bill, Jr. and other Keaton films are rumored for release soon) with multiple score options and a new audio commentary, with many other extras identical to those in the Keaton boxed set from November 2016. Fans who have yet to own either film on Blu-ray should consider this a Highly Recommended double feature, assuming you don't want to wait for the inevitable Cohen release.